Just as Marcia Brady had a crush on Davy Jones, so did I. Watching The Monkees on Saturday mornings was a big part of my days as a child; I loved all the members of the band, but none of them as much as Davy. Sadly, we lost our “Daydream Believer” today at the age of 66, the apparent victim of a heart attack. His death reflects the feelings I often have as I get older and watch people I was a fan of leave this world. I have difficulty connecting the fragments of time. 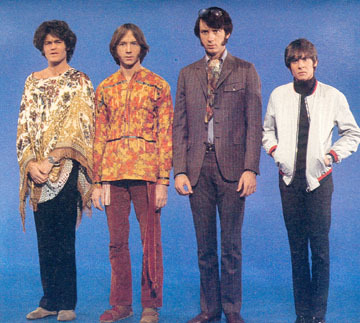 Was I really eight years old when I would sit riveted watching The Monkees on television? Was I that little when I played their 45s on my record player? It feels like yesterday, and yet it feels like a lifetime ago. I was lucky enough to see The Monkees in concert in Baltimore back in the 90s. They played at Pier 6 in the Inner Harbor, and I was in the second row with my dear friend Charles Steinberg. We had a ball that night, singing along to the songs, dancing in our seats, and making direct eye contact with the members of the band. Davy looked right at me when he was performing. It was a huge thrill for me. Yes…Davy Jones…David Cassidy…Leif Garrett…Donny Osmond…these were some of the names of my little childhood crushes. Remember—back then there was no Internet, no iPads or iPhones, nor was there CNN. My friends and I got all the celebrity news we could from Tiger Beat magazine. I would walk to the corner drugstore in Bowie, Maryland, with my friends and spend my allowance on gum, candy, and Tiger Beat. I would pore over it, and saved my old copies. Now Davy Jones is gone, and it feels like part of my youth has died right along with him. Wouldn’t it be great to spend one day being eight again? To catch fireflies, play SPUD in the backyard, wash your Barbies’ clothes in a bucket and hang them on the line outside to dry, and dance with your friends to The Monkees theme song? I realize I’m getting a little sentimental about a man I never really knew or met, but it’s a little bigger than that. It’s about a link to my childhood, one that I think of fondly, enjoyed, and wouldn’t trade for anything in the world. He was a connection to that time, and I will miss his mere presence as a reminder of what once was. Ummm wasn’t I also with you at the their concert in the 90’s!!! I thought we were in college during their tour. You quite possibly were there. Were you?